Eiko happily completed all 46 programs of the six week Platform presented by Danspace Project. It was the most intense series of performances and programs she has ever been involved in. In addition to her daily solo, in various sites at various times, Eiko designed 24 hour photo exhibition and co-curated guest performances and discussions. She also curated a weekly installation, film series, and book club. 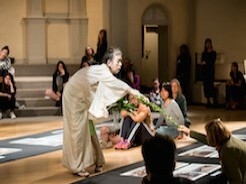 Eiko performed with invited guests for Precarious and Talking Duet and taught a weekly workshop. Judy-Hussie Taylor and Lydia Bell were the curators of the entire Platform and Eiko enjoyed working with them tremendously. She is deeply grateful to all the artists who participated in performances and discussions.